King, David C. Colonial Days: Discover the Past with Fun Projects, Games, Activities, and Recipes. (American Kids in History) San Francisco: Jossey-Bass, 1998. Leon, Donna. The Golden Egg. New York: Atlantic Monthly Press, 2013. Brunetti is put on an insignificant case regarding vending laws, but his wife Paola has a request for Brunetti. She learned that a deaf handicapped boy who had worked at the dry cleaners has died from an overdose of sleeping pills. She thinks it strange that no one has taken notice. Brunetti begins looking into the boy's past and discovers that there is no record of his having ever been born and that there are none of the usual records to even show he exists. When his mother is questioned, she claims the papers were stolen in a burglary. Brunetti systematically works through his discoveries until he understands how the boy and his mother were able to survive with what appeared to be no source of income. I found this an interesting read, but it wasn't totally absorbing, and I wouldn't really classify it as a mystery in the traditional sense of the word. I prefer Brunetti when he's investigating a murder and traveling around the canals of Venice. I received an electronic galley of this book for review purposes from NetGalley. Strout, Elizabeth. The Burgess Boys. New York: Random House, 2013. Gunderson, Mary. Pioneer Farm Cooking. (Exploring History Through Simple Recipes.) Mankato, Minn.: Blue Earth Books, 2000. This short book gives a general idea of what farm life might have been like in the Midwestern United States as those states were being settled by early pioneers. The book discusses some of the chores that would have been involved and gives a few recipes which have been somewhat modernized. There's a recipe for apple butter that looks really easy to make and should be quite tasty that I may have to try. The book could be used to describe typical life on a farm during that period. Marsico, Katie. The Doctor. (Colonial People.) New York: Marshall Cavendish, 2012. There is a great deal of information on the practice of medicine in the Colonial Period of United States history in this small book. It contrasts the preparation for the profession in this country mostly by apprenticeship with the more formal training provided in Europe. It discusses the distrust of Native American remedies by the medical profession but the popularity of them with the general population. The book is probably most appropriate for a middle school audience contentwise, although the layout and typefaces suggest that the book was intended for a younger audience. This would be a useful book for youngsters who have Colonial ancestors who were doctors or barbers or for those whose ancestors may have had a documented illness where they were treated by doctors or using folk remedies. Bethard, Wayne. Lotions, Potions, and Deadly Elixirs: Frontier Medicine in the American West. 1st paperback ed. Lanham, MD: Roberts Rinehart, 2013. Bethard, a Texas pharmacist, has penned a book dealing with medicines used on the frontier up through modern times. The first two sections are a hodge-podge of information on from the types of medicines used and the effects various treatments had. The third part is an alphabetical listing of medicines with brief entries describing the history of their use and dates used medically. Next comes a chronology of frontier medicine that is not strictly limited to medicine. There are entries such as "Lewis and Clark begin expedition." Before the bibliography is a glossary of old medical terms. The author employs humor in his narrative. Many of the examples come from Texas, which may be a bit of a weakness in drawing widespread appeal. I believe its chief use will come from consulting the material in section three although many readers will have to look beyond these brief entries for additional information. Still, this is a good resource for persons who have an interest in medicines available in America's earlier days. This review is based on a copy received through LibraryThing's Early Reviewer program with the expectation that a review would be written. Helm, Leslie. Yokohama Yankee: My Family's Five Generations As Outsiders in Japan. Seattle: Chin Music Press, 2013. Journalist Leslie Helm explores his family's past. It began when a German ancestor immigrated to Japan. Even though his family is now part Japanese, part German, and part American, they have difficulty fitting in any culture. While the narrative does not follow chronological order, it is fairly smooth and workable transition for the reader. Leslie and his wife adopt Japanese children and are faced with some challenges from this as well. I would have liked to have seen more documentation (in the form of citations) in the book although I know that was not the best. The book included many photographs but the subjects and context were not identified. It is hoped this was remedied in the final version. I also caught a few typographical errors and even one instance of the wrong city being named (which was obviously incorrect because of the context). Hopefully, the editors caught these. This is a good introduction to what Japanese culture was like for outsiders throughout the 19th and 20th centuries in Japan. Persons with an interest in Japan will want to read this one. This book was received through LibraryThing Early Reviewers with the expectation that a review would be written. Petersen, Christine. The Miller. (Colonial People.) New York: Marshall Cavendish, 2012. There is a wealth of information contained in this book about the milling profession during the colonial period. Much of the information is too advanced for the elementary school student, yet the larger print will probably put off middle school readers. This would be useful to gain an understanding of this occupation if one's ancestor was engaged in it. Computers and databases were in operation when I began my own research. I believe I started on Windows 3.1 with a genealogical database that contained fields for things like births, marriages, and deaths, but not much more. One had a total of 10 lines in which to write any notes or track sources. Let's just say that it was somewhat impossible to have a properly documented database. I'm quite grateful for databases of today like RootsMagic and Legacy Family Tree which provide us plenty of space for note-taking as well as the ability to create citations that meet standards. If we can't locate that piece of paper with that specific information, we can at least know what our source was so we can locate it again! I have no idea why I began thinking of this this morning, but I hope I'll be a bit more forgiving of the people who compiled genealogies in the days before computers without properly documenting the sources to current standards which didn't even exist back then. Stampler, Ann Redisch. 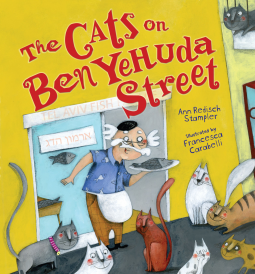 The Cats on Ben Yehuda Street. Ill. by Francesca Carabelli. Minneapolis, Minn.: Kar-Ben/Lerner Publishing Group, 2013. This is a charming book that shows the bonds between cats and the persons they own. The illustrations are cute, and the book shows how cats adopt their pet humans. Any child or adult who is owned by a cat will love this one! This review is based on an advance reader's e-galley provided by the publisher through NetGalley. Howard, Ellen; ill. by Ronald Himler. The Log Cabin Church. New York: Holiday House, 2002. Elvirey moved to the Michigan frontier from the Carolinas with her father and grandmother after the death of her mother. The women of the community all want a church. Elvirey doesn't really remember church. The Carolinas to Michigan is not a migration pattern one would typically anticipate; however, I checked the 1850 census for Michigan via Ancestry.com and found 808 persons born in North Carolina residing in Michigan and 188 persons born in South Carolina there. While the numbers aren't great, they do support some migration from that part of the South to the upper midwest. The story line did not grab me like I thought it might, and the illustrations fell a little flat. The book, however, does illustrate the fact that churches usually came along after a group of settlers arrived and banded together to have one established.